At the start of another academic year teachers and lecturers at all levels meet new classes, new faces. In secondary education teachers often have to know 200 pupils by name, and if you are starting out in a new school learning names can be particularly daunting. On the other hand, it helps to learn pupils’ names quickly. Firstly, you are able to build a better rapport with the people you are teaching and secondly it is so much easier to say “Henry, stop chatting” than “you, with the blue jumper, sitting next to another child with a blue jumper, stop chatting”. Similarly, in higher education, too, addressing students by their first names in seminars encourages participation. If you are able to access a class register before the term starts, read it. Check if you know how to pronounce students’ names. If you don’t, tell your students that the names are unusual for you and ask them to tell you how to say the names. There is nothing more impersonal than having your name mispronounced all the time. Some international students may prefer to choose an “English” name, and if they do, then you should give them that choice, but don’t force them to take on a name just to make learning names easier for yourself. Many institutions have got class lists that include the student’s name and a photo. If you can get hold of that, try to familiarise yourself with students’ faces at the same time as with their names. Obviously, the photos are not always a good representation of what people look like in real life, but they may just give you that starting point to learn names. This is a great starter activity in any new class anyway. Let students write their names on a paper or card to prop up in front of them. But get them to add a touch of personality to their card, such as a hobby. That way you start making connections to their interests and it is easier to remember the child that supports your own football team or that likes music, for example. At the same time, you get to know your class and by taking an interest who your pupils are and where they come from you start building a good relationship. If you are in the same room all the time, it may be worth considering having a seating plan and asking students to sit in the same place until you have learnt all their names. Personally, I don’t like seating plans because as a teacher you take away choices. 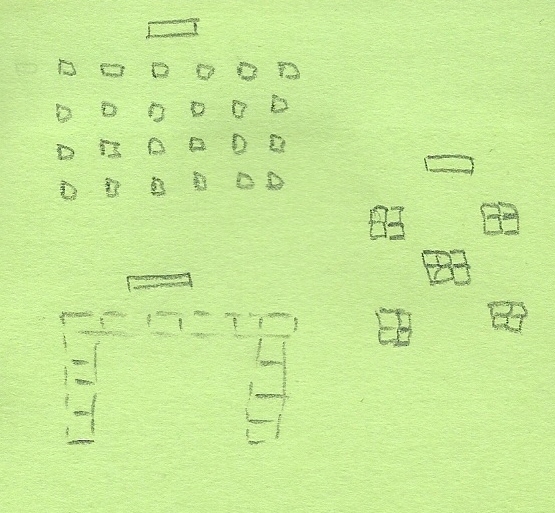 And so I tend to use seating plans for classroom management purposes, where I am deliberately taking away choices. But if you are new to the profession seating plans certainly are helpful for learning names quickly. As with the name cards, this is about getting to know your students. So by merely finding out who they are and where they come from you may be able to make connections. One thing I always cling on to is curly hair. This is because I, too, have curly hair and find it hard to manage, so anyone else with curly hair seems to be quite memorable for me, too. I tend to use most of these strategies, as I find it incredibly important to get to know the person in my class. They are the learners I am trying to collaborate with in order to improve their knowledge and understanding. Knowing pupils’ names, knowing about their lives and interests makes it easier to make the content relevant to them.